Information – The 2017 Boys State Manual has been updated and is now online at www.texasboysstate.com In the top header bar on the website click on “Manual” this will open a drop box with 3 items each of which when opened will have additional items. It is highly recommended that selected delegates and all persons involved in the Boys State program carefully read the manual. There are several changes this year of which everyone needs to be aware. The cost to sponsor a boy to Boys State is $400 which covers all expenses. Contact your local post to arrange sponsorship (post locator). Due to unprecedented support at the Post, District & Division level, applications to this year’s Boys State Program are running 50% ahead of last year’s record numbers and more than double the registrations for 2015. Additionally, the number of approved, paid registrations are also running more than double last year’s record highs. While these outstanding numbers are something of which to be extremely proud, I would like to ask that at each Post you now double your efforts to convert those applications into registrations as quickly as possible , provided, the applicant meets the Post’s standards. We are in the midst of planning and preparing for this year’s program and one of the most difficult things we have to do is estimate the counselor and staffing needs when historically 80% of our registrations come to Legion HQ in the last two months before the program begins. We are asking that you press to finalize the registration process so that we can do a better job of anticipating our staff needs and continue to present an outstanding product. 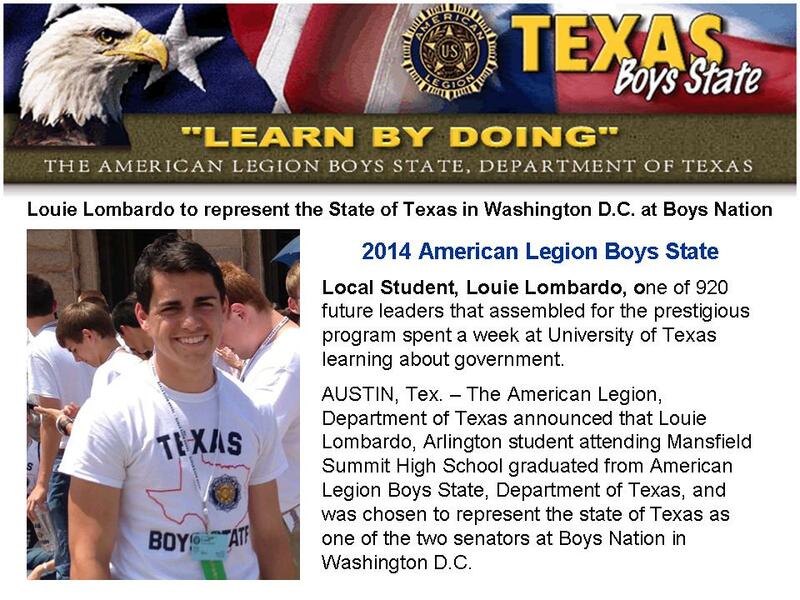 This year Texas Boys State will accept the first 1,200 Applications and then a “Wait List” will be started. We want to ensure that no qualified and deserving candidate is left behind from this “once in a lifetime opportunity", so it is important that we keep all Posts informed on where we stand in relation to our cap on applications. Applications - We are in the 5th week of opening applications and we are 50% ahead of where we were last year at the same time and last year was way ahead of the previous year. Registrations - We are now 40% ahead of where we were last year at the same time and last year was way ahead of the previous year. What is the difference between an Application and a Registration? What this means is - it is very important that Posts move quickly to select their candidates and forward to Austin both the completed application and check for tuition. Dates: Sunday, June 11th through Friday, June 16th, 2017. Deadline for registration > May 15, 2017 or when 1200 applicants have been received. A wait list will start on May 16, 2017. Do not allow one of your delegates to be left out due to late or incomplete registration. 2017 Applications are already running far ahead of previous years. We are limited to the first 1200 applicants.